Facebook CEO Mark Zuckerberg posted on Facebook on Wednesday about the Cambridge Analytica scandal, the first time he's talked about it publicly. 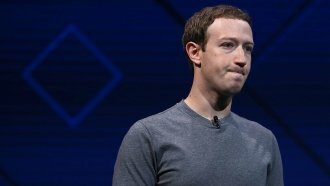 Facebook CEO Mark Zuckerberg is finally talking about the Cambridge Analytica scandal. In a lengthy Facebook post Wednesday, Zuckerberg said the data firm's ability to collect data improperly was a breach of trust between Facebook and the people who use the social network. Zuckerberg laid out several ways Facebook plans to change things to ensure something like what Cambridge Analytica did can't ever happen again. That includes investigating apps that collected lots of people's information before Facebook put new safety measures in place in 2014, restricting the amount of information apps can gather about you, and keeping users up to speed about what information they've given to which apps. Zuckerberg did say, though, that the biggest changes needed to combat improper info sharing happened years ago, when he says the company dramatically reduced the information apps could get on you or your friends. He says the information Cambridge Analytica is accused of using was gathered in 2013.